The latest rare EarthBound merchandise to hit the auction block is a set of EarthBound pogs! I never understood the appeal of pogs, even back in the day, but when they were popular Nintendo Power made several sets that you could order through the magazine. 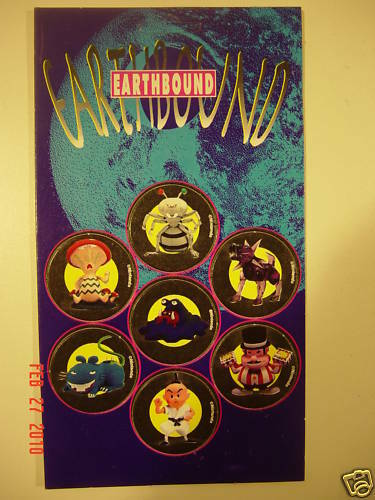 One was a set of EarthBound pogs, and it goes without saying that they’re quite hard to come by nowadays. Also, according to Starmen.Net, the pogs are scratch n sniff and smell like pizza. I don’t think this has ever been confirmed, for some reason I think it might’ve just been an old rumor. If anyone gets these pogs or if anyone already owns a set of them, could you confirm/deny the smelliness claim? 35 Comments to Rare EarthBound Pogs for Sale! It’s beyond insane. New Mr. Saturn plushes, the ruler, the Franklin Badge (maybe), these POG’s, and the Newspaper that was included with that one Complete EarthBound auction. It’s…. just too much for one wallet to handle. Keep watching guys, I’ll bet that a Mr. Saturn statue will show up on Ebay in a few days. Seems to be a valid bet, given the current merch situation. It’s back… in Pog form. They’ll probably go for a lot. …I’m gonna make my own EB Pogs someday. They will be awesome in their crappyness. You can buy Pog Makers online. Of course, you couldn’t make EB pogs that are attached to a cardboard backing as easily as you could make loose ones, but I digress. lol Roo, I see what you did there, and I like it. As I mentioned before, there is TOO MUCH MERCH!!! This is just too much for my budget, Pogs, Ruler, Badge, F*CK! I have a set of the pogs, and I can confirm that they are not scratch and sniff. The only smell they have is of old cardboard from the ’90s. @Pigmask Private: Oh jeez! A Mr. Saturn statue would be AMAZING! What kind of rich idiot bought the EB0 proto? OH THATS RIGHT. ROO. This looks like I’ll need to call for my super team of awesome fighting money stealing Monkeys for this type of assignment. Alright, now this is just crazy. All this stuff appearing in a few months… wow. I really have no idea what these will end up going for, let alone the ruler. THAT IS IT!!! I am buying this! AND the Franklin Badge! And NO ONE is gonna stand in my way. If someone snipes me, I’ll flecon punch them! OH NO, I ALWAYS, ALLLLLWAAAAYS WANTED THESE WHEN I WAS LITTLE. T__T I’m never going to get them with all you people and your money. Way to go BroBuzz, keep up the nonsense talk. You have yet to sound like an intelligent individual. You guys act like a bunch of thugs, boasting of “sniping” and calling “dibs” on everything up for auction. Good luck to everyone, okay? I would not be surprised to see the 64DD Spaceworld 99′ Mother 3 demo put up on eBay next! (We could only hope 8O) But the string of epic rare swag put up lately it only seems the next logical step! Imagine how much that would bring in??!! How do you play with pogs? I guess I never heard of the fad. You stack ’em… AND SLAM ‘EM! @ MG – You must be too young to have been around during the days of pogs, it was basically gambling at my school, whoever had the cool pogs were cool; until the day EVERYONE stopped playing, and it was like taboo to even mention them, that was the last fad I fell for as a kid. The benefit of not spending so much money on every item now is having a lot more to spend if/when something like a MOTHER 3 64 proto goes up. I’d be willing to toss a lot of cash out on that thing if it ever did surface. If they WERE scratch and sniff, what would Poo smell like?